Community Consulting Group, New York, USA. Received March 24th, 2010; revised May 11th, 2010; accepted May 13th, 2010.
as ableism or disability oppression. growing bu rde n of psychiatric disease. 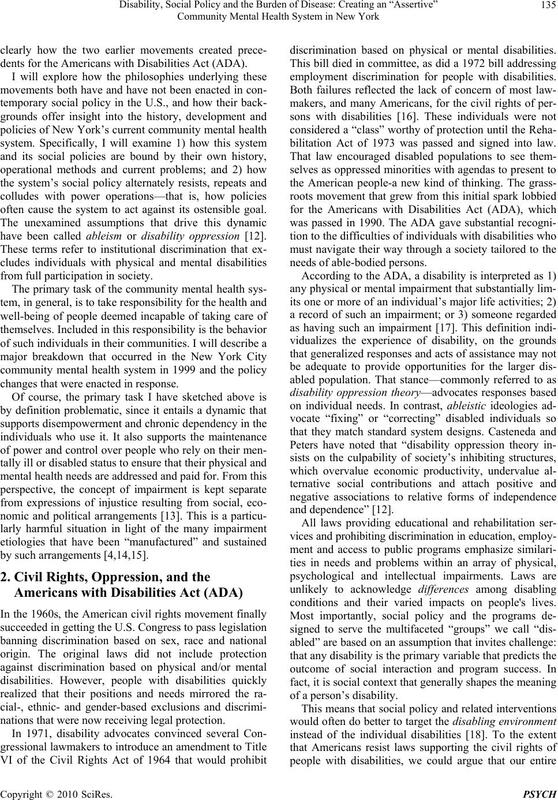 dents for the Americans with Disabilities Act (ADA). often cause the system to act against its ostensible goal. have been called ableism or disability oppression . from full participation in society. changes that were enacted in response. nations that were now receiving legal protection. 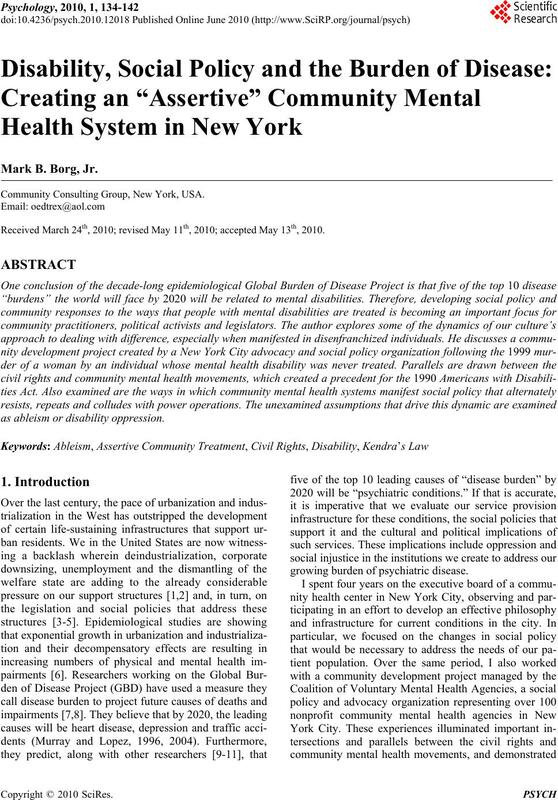 discrimination based on physical or mental disabilities. employment discrimination for people with disabilities. bilitation Act of 1973 was passed and signed into law. conditions and their varied impacts on people's lives. promised community-based treatment programs . pits public safety concerns against individual rights. project’s predi c t i on. sane when he pushed Ms. Webdale in front of the train. often are) insurmountable [28, emphasis in original]. of such people and impose constraints upon them instead. tice of ignoring, or dissociating the suffering of others. tion, criticizing deviation s or threats to this tradition . underlyi ng pr o bl ems associated with these dynamics. vides adequate care for the people it is meant to serve. neighborhoods of our country’s most diverse city. address the failure of communities to p rovide that care. have suggested, an act so random as to be unavoidable. or crisis intervention does not work . resources—especially legislative— required to provide it. abilities to be treated in humane ways. the introduction of new pharmacological treatments. regimens and treatment programs [54-56]. lition to start an ACT program well before the murder. needs of the mentally disabled. 10) Focus on patients’ individual strengths and needs. ACT requires to evolve and maintain its effectiveness. “leash laws” (a less flattering term). and sustained in part by, input from its beneficiaries. issues are also part of the disabled population equation. institutions and policies meant to serve them. burden us from those anxieties. they need for safety, empowerment and well-being. State,” Oxford University Press, 2002.
the Welfare State,” University of Chicago Press, 2001.
bridge University Press, Cambridge, 2002.
national Policy,” Palgrave Macmillan, New York, 2001. PLoS Medicine, Vol. 3, No. 11, 2006, p. e442. Vol. 37, 2004, pp. 10-14. J. A. Haagsma, A. H. Haavelar, M. F. Janssen and G. J.
Metrics, Vol. 6, 2008, pp. 345-368. New York, 2000, pp. 310-325. Handicap and Society, Vol. 2, No. 1, 1987, pp. 5-20. Teachers College Press, New York, 1992.
orders,” Health Affairs, Vol. 22, No. 5, 2003, pp. 28- 38. Vol. 19, No. 4, 1999, pp. 463-483. Justice Matters, Vol. 31, 1998, pp. 21-34. 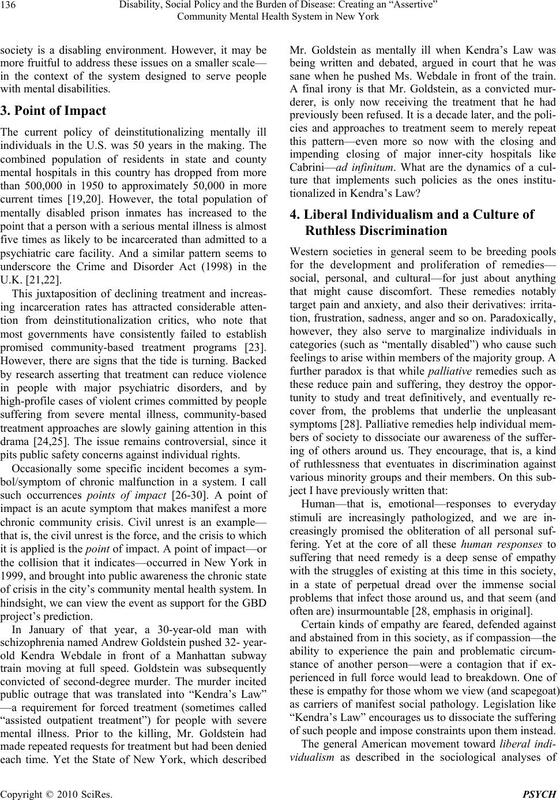 Journal of Public Health, Vol. 92, 2003, pp. 1523-1531.
of Health Psychology, Vol. 7, No. 3, 2002, pp. 345-357. Society, Vol. 9, 2005, pp. 212-233. Publishers, Happague, 2010, pp. 1-66. “Can Psychoanalysis Exist outside the Consulting Room? R. Bellah, R. Madsen, W. Sullivan, A. Swindler and S.
Wilson Quarterly, Summer 1992, pp. 74-107. Internal Life,” Karnac, New York, 2001.
tural Press, New York, 1999. Practice,” Jossey-Bass, San Francisco, 1999.
dynamic Practice, Vol. 10, No. 1, 2004, pp. 89-106. Power?” Berrett-Koehler, San Francisco, 2004. Palgrave Macmillan, New York, 2004.
on Children,” Palgrave Macmillan, New York, 2000, p.
Press, Bristol, 1995, p. 3.
lems,” Plenum, New York, 1986.
versity Press, Princeton, NJ, 2001. 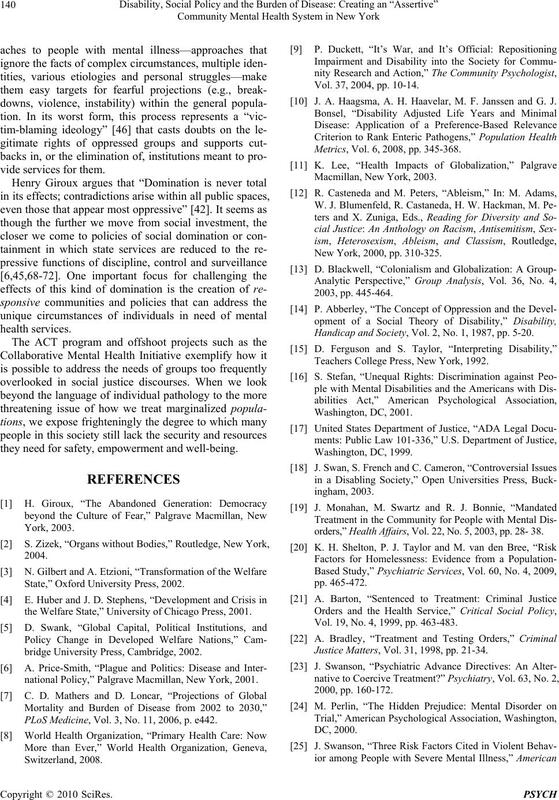 Mental Health Agencies, New York, 1999, p. 3.
praisal,” Community Development Journal, Vol. 36, No. Policy, and Law, Vol. 9, No. 1-2, 2003, pp. 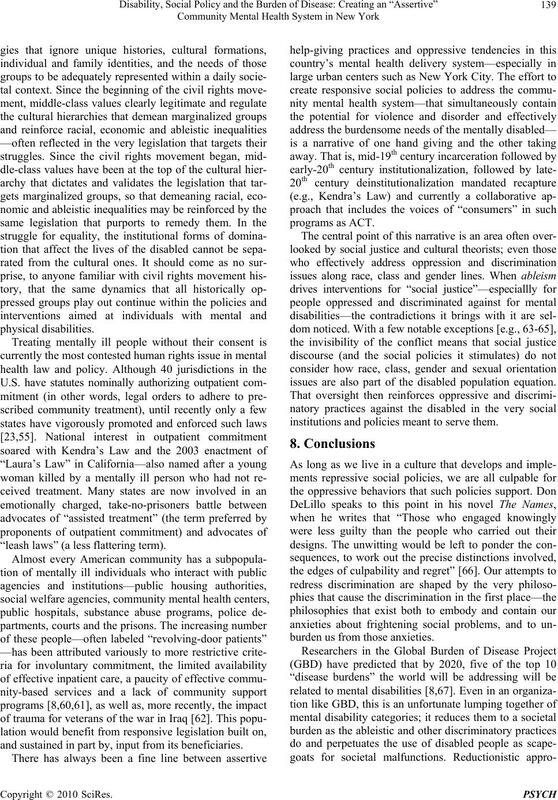 70-93.
versity and Social Justice,” Routledge, New York, 2007. Services, Vol. 55, No. 11, 2004, pp. 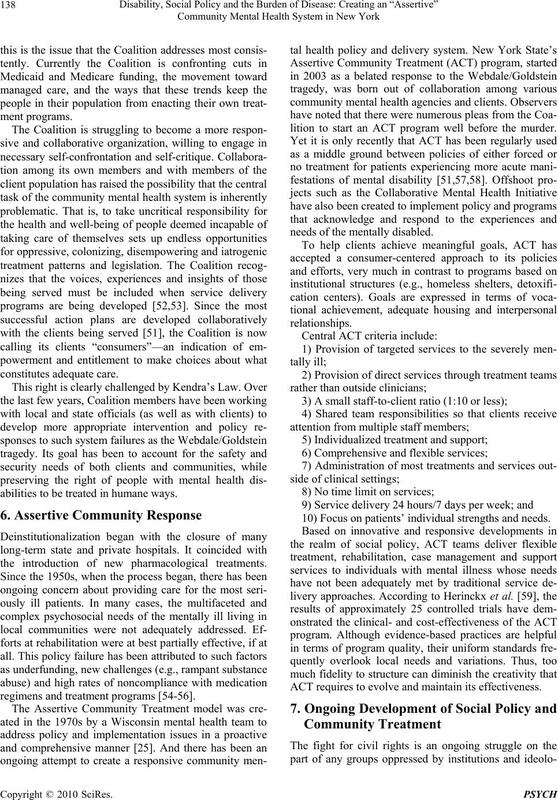 1285-1293.
ness,” Psychiatric Service, Vol. 48, No. 10, 1997, pp. 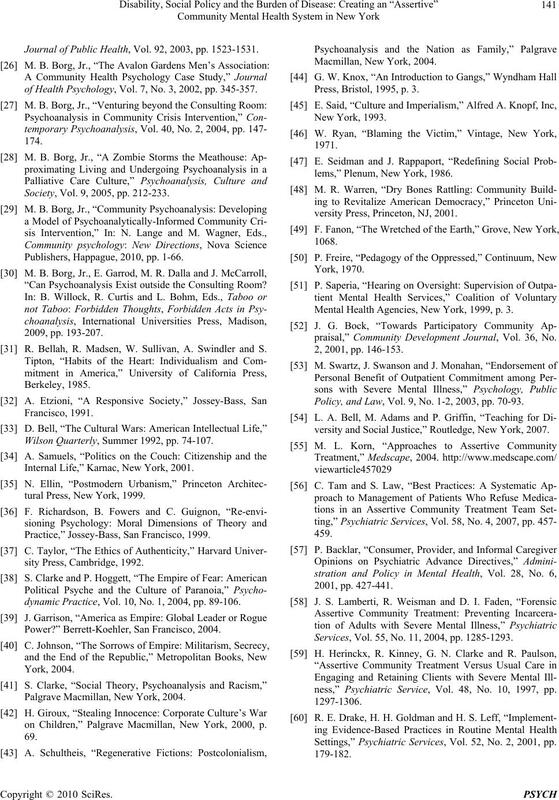 Settings,” Psychiatric Services, Vol. 52, No. 2, 2001, pp. 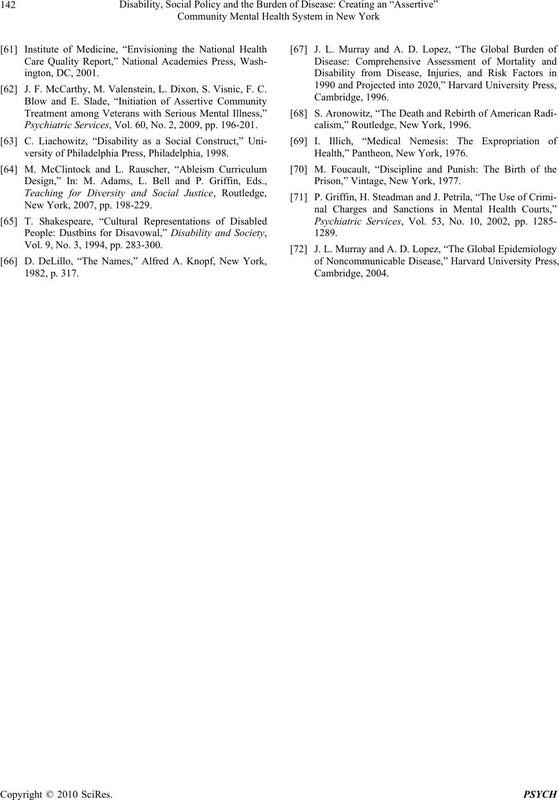 J. F. McCarthy , M. Valenstein, L. Dixon, S. Visnic, F. C.
Psychiatric Services, Vol. 60, No. 2, 2009, pp. 196-201.
versity of Philadelphia Press, Philadelphia, 1998. New York, 2007, pp. 198-229. Vol. 9, No. 3, 1994, pp. 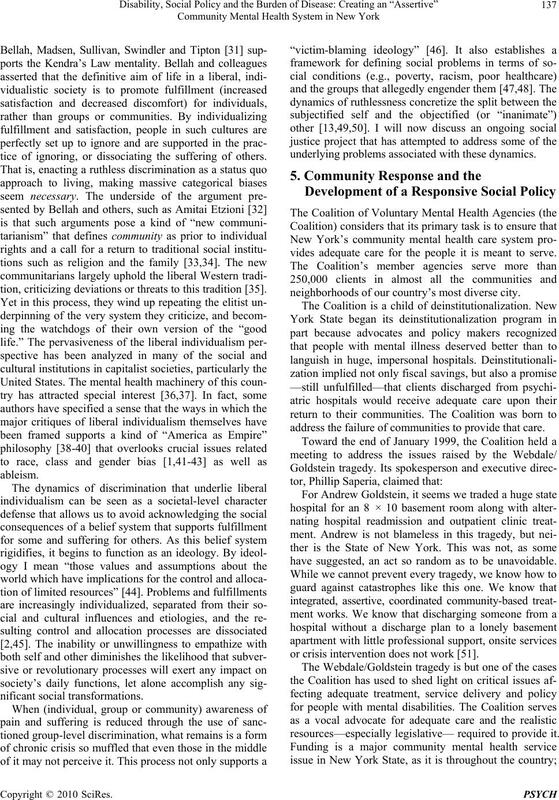 283-300.
calism,” Routledge, New York, 1996. Health,” Pantheon, New York, 1976. Prison,” Vintage, New York, 1977.